Illumination is a key feature of the Black Book of the Garter which, commissioned by King Henry VIII in 1534, documents the Knights of the Order of the Garter from its origin in 1348 until 1551. Accounts of the household for the King contain regular payments to Lucas Hornebolte (an anglicised form of his real name: Horenbout), a Flemish painter described in the accounts as a “pictor-maker”. He was appointed King’s Painter, and worked as court miniaturist to Henry VIII from 1525 until his death, painting several famous miniature portraits including those of Henry’s wives and children. Horenbout’s miniature portraits appear to use a technique very similar to that in the illumination of manuscripts, thus it has been identified that Horenbout was the illuminator for the Black Book. Lucas Horenbout was born in Ghent around the year 1490 and trained with his father, who was a manuscript illuminator. In the 1520s Lucas, along with his father, Gerard, and sister, Susannah, moved to England. It has been suggested that they moved to this country in order to help the attempted revival of English manuscript illumination, but there is no definite evidence for this. Nevertheless, Horenbout is considered by many as the founder of the English school of portrait miniature painting. While the ensuing two volumes of the Register of the Order of the Garter are also decorative in keeping with a similar style, the Black Book is undoubtedly illuminated to a higher quality. Not only does it contain several pages on which the Sovereigns since the start of the Order are represented, surrounded by beautifully designed borders, but decorative initials are a continuous presence throughout. 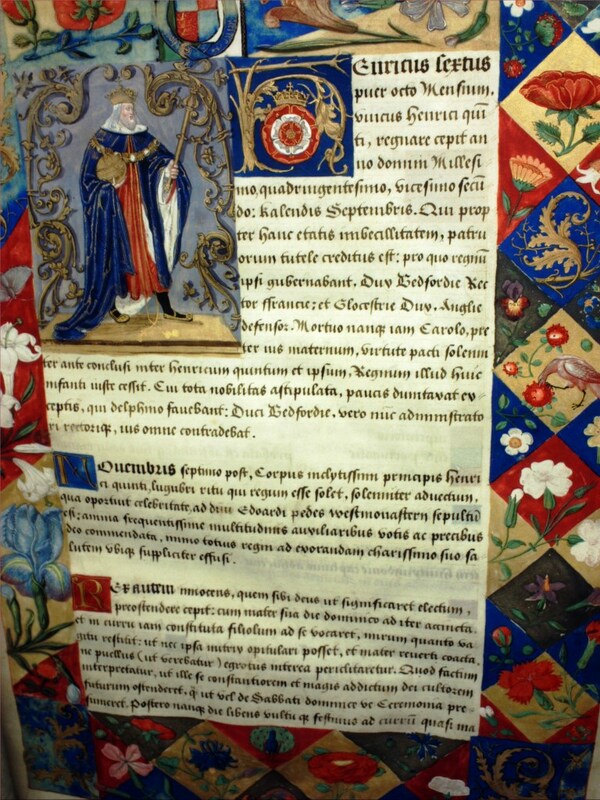 On the whole, the use of the colours red, blue and gold are most prominent, with each initial of the start of each paragraph or title of Sovereign or Knight, written in gold and backed by a square of blue or red alternately. Due to the highly decorative nature of the Book in comparison to the other registers of the Order, King Henry VIII may have commissioned it as a status symbol to display his wealth and power as King of England and Sovereign of the Order of the Garter. The ornate use of the colour gold throughout conveys the sense of wealth, and the more extravagant decoration for the Sovereigns sets Henry VIII’s pages apart from the rest of the book, suggesting its purpose wasn’t merely to document the statutes and the foundations of the Order. Likewise, toward the centre of the Book on a double page spread are four illustrations depicting a Garter procession and Henry VIII surrounded by the Knights of the Garter, further exhibiting his status, and emphasising his involvement in the creation of this first volume of the Register of the Order of the Garter. By comparison, all other monarchs who appear in the Black Book have only one small miniature portrait to mark the start of their reign.